The Sunflower Star (Pycnopodia helianthoides) is the largest sea star in the world. They can grow to 40" across, and have up to 23 arms. The Sunflower Star below is appoximately 21" across and has 19 arms. Sunflower Stars have pedicellariae, tiny pincers that keep the skin free of parasites. If you rested the top of your forearm on the upper surface of most sea stars (not the Bat Star, Leather Star or Blood Star), the pedicellariae would "pinch" the hair on your arm and you would definitely feel a pulling when you removed your arm. The Sunflower Star, like many other species of sea stars, comes in a spectrum of colors including yellow, orange, gray, blue and purple. The most prevalent color of Sunflower Stars on the southern Oregon coast is a reddish-purple, like the one pictured below. Sunflower Stars move very fast compared to other sea stars and can move as fast as 5 feet a minute. 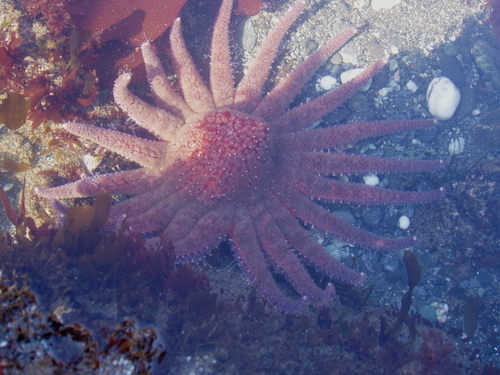 They have voracious appetites, and no intertidal animal is safe when the Sunflower Star is nearby! In the photo below, please note the white hair-like tube feet extending from the stars' upraised arms, with which it captures its prey. 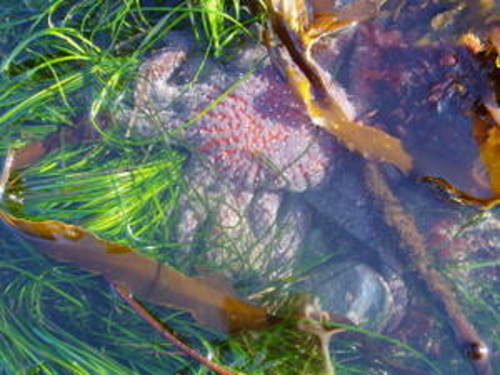 When you touch a Sunflower Star under water, the skin feels like wet fleece...very soft and mushy. 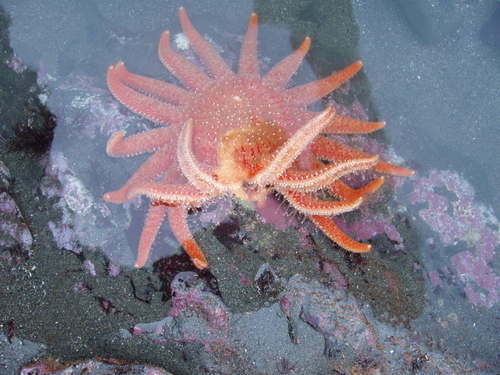 When a Sunflower Star is stranded on rocks or sand above the tide line, it dries out, becomes desiccated, and is gelatinous in appearance and to the touch (see below). 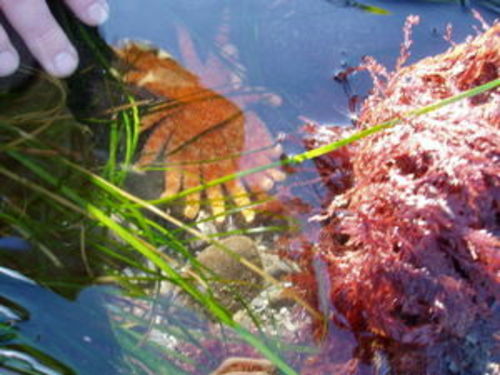 Desiccation is one of the potential hazards for stars and most other intertidal animals. Sunflower Stars have only 6 arms when they are very young, and add arms as they age. The Sunflower Star pictured below has at least 15 arms, but is only 4-5" in diameter. I cannot conceive of a God who rewards and punishes his creatures, or has a will of the type of which we are conscious in ourselves. An individual who should survive his physical death is also beyond my comprehension, nor do i wish it otherwise; such notions are for the fears or absurd egoism of feeble souls.